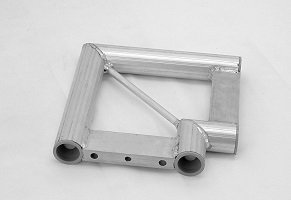 We have introduced a folding ladder truss base to our range. This provides a quick and easy base for goalpost support, keeping a neat, truss appearance, with as much strength as a banner requires, but being able to assemble/ disassemble quickly and stow in limited space (e.g. car boot). Use with SST25SC to allow for maximum pre-assembly, in minimum storage space. Just add standard ladder trusses to give height, width.